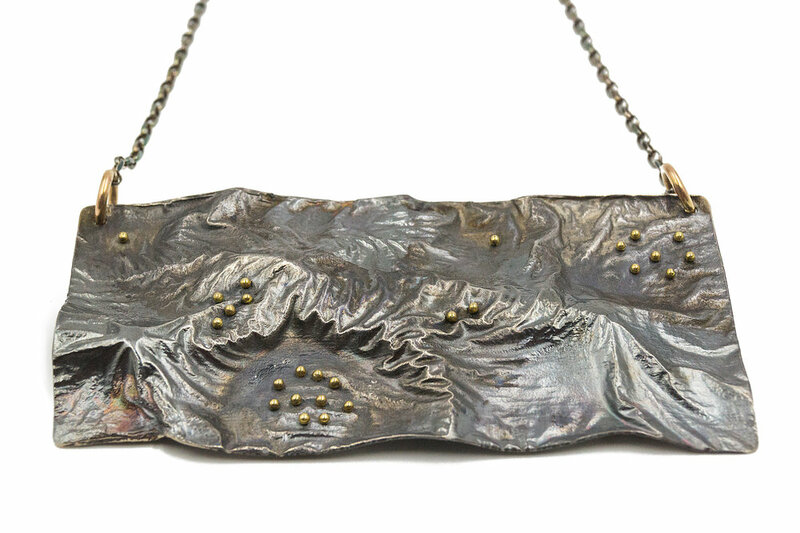 Jeila Martin Jewelry's signature style is oxidized reticulated silver, which is a process that can only be created by studio jewelers, and creates peaks and valleys in the metal by controlled heating. Reticulation involves heating a sheet of silver alloy up to 10 times to oxidize the copper at the surface, then placing the metal in an acid bath (known as pickle to jewelers), to remove the oxide and leave a thin layer of pure metal. After each heating and pickling, the metal must be brushed with a brass bristle brush as well. This process is called depletion gilding and results in different melting temperatures between the surface and the interior of the sheet. Once the sheet is gilded, it is heated with a torch and the alloy in the interior flows before the surface metal does. The surface wrinkles are the result! Reticulation is not difficult, but it does take practice, concentration, and a deft torch hand. The pattern and appearance of a reticulated piece unpredictable and you won’t get the same results twice, making every piece one of a kind. After reticulation, 18 karat gold granules are fused to the surface. We complete every piece by adding 18 karat gold jump rings, oxidizing metal, and placing it on an oxidized sterling silver chain. The result is wearable art that you will cherish forever! Subscribe to our newsletter for information about sales and new collections.